In the past, we left defining the security configuration for Windows 10 as a task for every customer to sort out. As a result, we saw as many different configurations as we saw customers. Standardization has many advantages, so we developed a security configuration framework to help simplify security configuration while still allowing enough flexibility to allow you to balance security, productivity, and user experience. We are defining discrete prescriptive Windows 10 security configurations (levels 5 through 1) to meet many of the common device scenarios we see today in the enterprise. While building out this framework, we thought: what are key considerations for a security professional in today’s world? This is the question security professionals must constantly ask themselves. Nearly every security architect I’ve met with has a pile of security assessments on their desk (and a list of vendors eager to give them more); their challenge is never identifying something that they can do, but identifying which is the next most important thing to do from the massive list they have already identified! 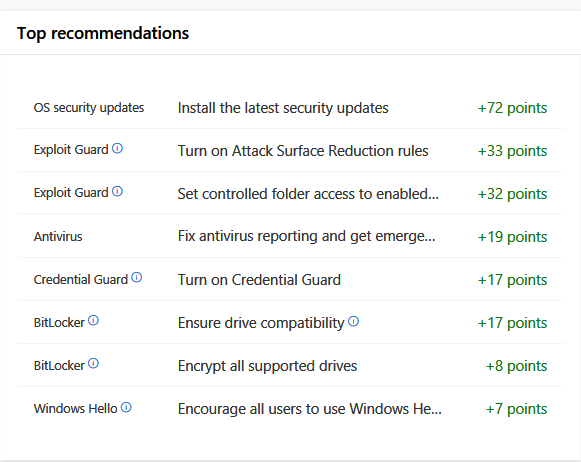 I also get questions from customers who are just now planning their Windows 10 deployment and are hoping to configure as many security features as possible – but since they haven’t deployed yet, they don’t have guidance from the Microsoft Defender ATP Secure Score yet (we’ll discuss that in a minute) – how can they prioritize the features to initially enable? Achieving early wins is a key aspect to driving business value from the investment in this deployment. Clearly, a key aspect for a security configuration framework is to help drive a smart set of priorities. Understanding where you lie in a continuum of security is also valuable. You see, there is no perfect score in security; everyone could always get better. What we really need to drive is a cycle of continuous improvement. But without an absolute target to pursue, how do you get a sense of how good is good enough? Looking at the posture of others is helpful. Being the best in security is of course aspirational, but being the worst is something you must avoid! There are other unintended consequences of being the “best” to be mindful of as well. Security configuration may be at odds with productivity or user experience; imagine if you worked for a software company and couldn’t test your own code because it wasn’t on your organizational safe programs list yet? I want to be careful not to overemphasize the competitive aspect here. You don’t want to go deliberately misleading your peers in the industry – in fact, one thing I’m deeply passionate about is improving cooperation among the people on the side of good. Why is this so important? Because bad people have, through innovations of commerce on the dark web, devised a system of cooperation that is shockingly effective. In an environment of inherent distrust (think about it – literally everyone involved is, by definition, untrustworthy), they work together. We’re at a significant disadvantage if we don’t learn to cooperate at least as well! In Microsoft Defender ATP, the secure score is the path to achieving this. Through the top recommendations, we suggest a prioritized list for securing your devices, with a relative ranking of the overall impact to your security posture. We are also exploring ways to provide useful comparisons using this framework. Secure score represents our best recommendations for securing your endpoint devices (among other things). It’s context-aware, driven by your existing configuration and the threats impacting your environment. One of the questions we’ve been asking is – what should you do if you have not yet purchased or deployed Microsoft Defender ATP in order to compute your secure score? What if you haven’t even deployed Windows 10? What if you don’t know exactly how to configure a given set of features? We thought we should supplement secure score to help people in all these scenarios with the security configuration framework. The security configuration framework is designed to assist with exactly this scenario. We sat down and asked ourselves this question: if we didn’t know anything at all about your environment, what security policies and security controls would we suggest you implement first? We worked with a select group of pilot customers, experts from Microsoft’s engineering team, and the Microsoft sales field to develop this guidance. Enterprise security – We recommend this configuration as the minimum-security configuration for an enterprise device. Recommendations for this security configuration level are generally straightforward and are designed to be deployable within 30 days. Enterprise high security – We recommend this configuration for devices where users access sensitive or confidential information. Some of the controls may have an impact to app compatibility, and therefore will often go through an audit-configure-enforce workflow. Recommendations for this level are generally accessible to most organizations and are designed to be deployable within 90 days. Enterprise VIP security – We recommend this configuration for devices run by an organization with a larger or more sophisticated security team, or for specific users or groups who are at uniquely high risk (for example, one organization identified users who handle data whose theft would directly and seriously impact their stock price). An organization likely to be targeted by well-funded and sophisticated adversaries should aspire to this configuration. Recommendations for this security configuration level can be complex (for example, removing local admin rights for some organizations can be a long project in and of itself) and can often go beyond 90 days. DevOps workstation – We recommend this configuration for developers and testers, who are an attractive target both for supply chain attacks and credential theft attacks that attempt to gain access to servers and systems containing high-value data or where critical business functions could be disrupted. We are still developing this guidance, and will make another announcement as soon as it is ready. Administrator workstation – Administrators (particularly of identity or security systems) face the highest risk, through data theft, data alteration, or service disruption. We are still developing this guidance, and will make another announcement as soon as it is ready. How do you choose the configuration that’s best for your organization? If you’re an organization that’s already looking to Windows security baselines to provide advanced levels of security (now also available in preview for Intune), then level 3 incorporates these baselines as the foundation. If you’re earlier in your journey, then you should find level 5 a great starting point and can then balance the enhanced security of higher levels against your application readiness and risk tolerance. We are releasing this draft version to gather additional feedback from organizations looking to organize their device security hardening program. You can find the draft security configuration framework documentation and provide us feedback at https://docs.microsoft.com/windows/security/threat-protection/windows-seccon-framework/windows-security-configuration-framework. We are eager to gather feedback on how we could make this guidance more useful, and if there are security controls and configurations you feel may be misplaced (or missing)! The post Introducing the security configuration framework: A prioritized guide to hardening Windows 10 appeared first on Microsoft Security.